The VFW facilitated the Voice of Democracy banquet o present the participating students their awards. Students who participated in Patrons Pen and the Voice of Democracy line up to take a photo. 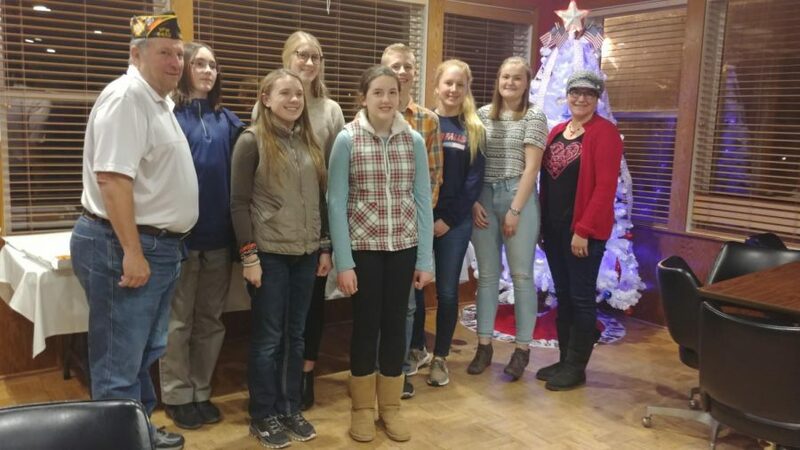 DOn the evening of January 7th at 6pm, 9 Cannon Falls students gathered in the VFW along with friends, family, and VFW members for the annual Voice of Democracy awards ceremony. Pizza from Dudley’s was served to the attendees. Voice of Democracy is a national program that starts at city level and gives participants a chance to make it to Washington DC on an all-expenses paid trip. If a student makes it that far, they can win a multi-thousand dollar scholarship. This year’s theme for Voice of Democracy was why your vote matters. Near the beginning of the school year, applications became available. Students are supposed to write a 4 minute speech about the theme and record it. Once the VFW receives all entries, they judge each speech. The competition is split into two sections: Patriot’s Pen for middle schoolers and Voice of Democracy for high schoolers. Starting with the Patriot’s Pen, VFW chairman, Duane Hermanson, announced the winners. The top 3 winners received a backpack, water bottle, certificate, and a check different amounts depending on their placement with first place earning up to $250. Teagan Strecker earned first place for Patriot’s Pen. Her speech was sent to the District level and placed 3rd. She has the opportunity to travel to Austin, Minnesota for that awards ceremony. Lauren Ritz placed second and Amera Wells placed 3rd. For Voice of Democracy, Laura Johnson placed first receiving $250 and read her speech to the audience. Lindy Edstrom placed second receiving $150 and Vanessa Peer placed third receiving $100. Ari Wells, Mitchell Hoffman, and Ryan Schlichting did not place but each received $25. Hermanson said every entry this year was very good and it was hard to judge them all. Next year’s information will be out near the beginning of the school year. They are looking for more students to participate and for the news to be spread. This is a great opportunity to learn more about America’s democracy and have a voice.